Mobile network operator 2degrees and prepaid card issuer Snapper have teamed up to enable commuters in the city of Wellington to pay for public transportation and purchases in local merchants with an LG Optimus Net NFC phone. New Zealand carrier 2degrees has partnered with Snapper, an issuer of stored value contactless cards that can be used on both public transportation and in stores, to launch the country’s first commercial NFC service. The new Touch2Pay service enables commuters in the city of Wellington, where 200,000 Snapper cards are already in circulation, to load up to NZ$300 (US$235.69) onto a virtual Snapper card stored on their NFC phone. They can then use the funds stored on their account to pay for bus and taxi fares as well as for purchases at a range of retailers and food service outlets that already accept payments via Snapper. 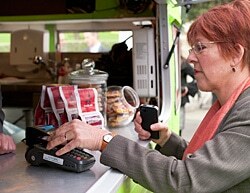 No PIN or signature is needed to complete a Touch2Pay transaction. The service is being launched with just one NFC mobile phone, the LG Optimus Net, which 2degrees is pricing at NZ$299 (US$235). “Other handsets across a range of price points will be released throughout this year,” says the carrier. Touch2Pay will make payment faster and easier for people on the go, says Eric Hertz, CEO of 2degrees. “We have been working with Snapper to launch this technology, which marks another step in the way mobile can make life better every day,” he explained. “The launch of Touch2Pay is the kind of innovation we believe Kiwis will really value, effectively enabling your mobile phone to swallow your wallet.”. To promote adoption of the new service, Wellingtonians who sign up for a 2degrees Touch2Pay phone by 31 July will also receive ‘Free Weekends’ with free bus travel in the Wellington area and 1GB of data to use at weekends for the rest of 2012. Last month 2degrees announced a partnership with Vodafone and Telecom New Zealand, the country’s two other mobile network operators, and bank-owned payments platform provider Paymark. The partners plan to create a central TSM for New Zealand. Telecom New Zealand is currently conducting an NFC pilot in the city of Auckland, in partnership with Westpac and Auckland Transport. Well done to our New Zealand neighbours on this great NFC campaign.